I want to draw your attention over the perpetual attack over the livelihood activities of agrarian populace at the Indo- Bangladesh bordering area. I brought this issue time and again before your good office but till date no specific and adequate remedial measure has been taken. The livelihood option is shrinking in both sides of the border as overwhelming majority of the populace are agrarian and agriculture is no more a better financial proposition, driving the populace for better options in cities and metropolises, the transition of human being is not less than forced migration and it is a reality for the populace living at the border. The day to day lives of the people are with fear and deprivation with minimum guarantee for livelihood. In Indian part of the border majority of the people are living in penury without or minimum administrative or governmental deliverance. In this circumstances the posted BSF personnel creating hazards and hindrances for regular agrarian activities. The problem related with demarcation of border is one of the major issue to reckon with, so far no consolidated border has been demarcated and people has to cross over the fence or border out post to reach their agrarian fields for harvesting and cultivation, in few cases even they have to cross the fences and posts to attend nature’s calls, even the pregnant women being restricted to visit nearby medical facilities during their childbirth as the BSF would regulate their labour. While during this they have to mortgage their citizenship identities to posted personnel of BSF. The administration or BSF are deciding the timings for entry and exit from their own land. The whole bordering roads is generally propagated as the property of the BSF; while in actuality the roads were constructed by Central Public Works Department (CPWD) for common use, the guards restricting movements of bonafide citizenry, Here, I am referring the ongoing misdeeds of BSF personnel at Gobindapur area under Swarupnagar Police Station of 24 Parganas (North) district and restriction posed by the BSF on regular agrarian activities. The said area under Swarupnagar Police Station of North 24 Parganas district is very fertile; two main crops are paddy and jute. The main occupation of the residents of that area is agriculture. 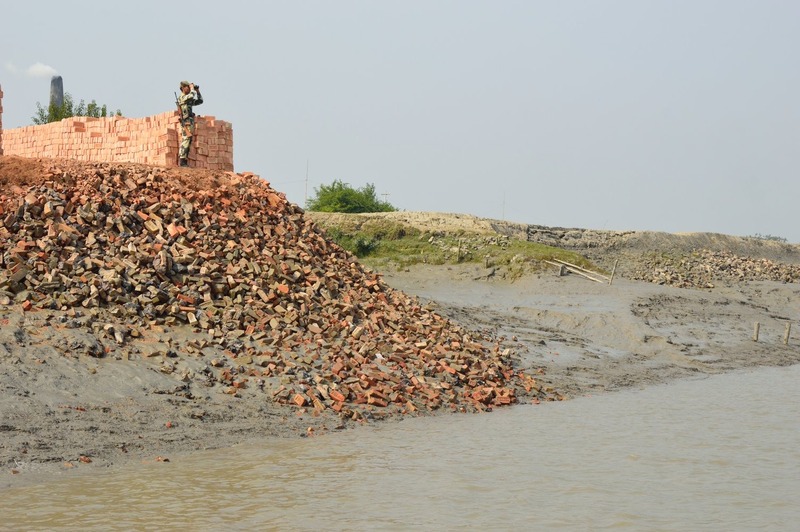 The area is close to Indo- Bangladesh border and at Gobindapur, the border road and fencing is situated; a large area of cultivable land is situated between the actual border and the erected fence; like many other areas of the mentioned border; and this is the reference point of ongoing unjustified restriction by the BSF personnel to visit and perform regular activities of agriculture. Farmers owning the land being harassed, restricted to visit their own land and even threatened and abused. This is an ongoing practice for the posted BSF for last 15 years. The poor farmers requested the respective Block Development Officers and local Panchayet members and officers for help; but in vain, no appropriate measure has been taken and situation unchanged and the citizenry still under the unjustified and unconstitutional subjugation of posted BSF personnel. Due to this unjustified restriction, the poor farmers only cultivate the land which is inside the Indian side of fence leaving a sizeable amount of land without agrarian purpose; resulting a great financial loss. Further, recently they are facing another form of subjugation and unjustified restriction from BSF personnel posted there. The farmers are generally cultivating paddy in winter and jute in the summer. This year the Border Security Force (BSF) personnel of BRAVO – Company; Gobindapur Border Out Post (BOP) under BSF Battalion Number- 152 obstructed the farmers of the area to cultivate jute; which they supposed to sow in April. The BSF personnel made an excuse that crops have height of 4 feet and above would not be allowed to cultivate at the adjacent area of Indo- Bangladesh border. The pretext is security reasons but in contrary it is evident that the cross border smuggling and illegal movements are facilitated by active involvement of the Border security Force personnel. This action of BSF put the majority of agrarian community in penury and destitution. The panchayet member of Gobindapur village Panchayet; Mr. Jamat Sardar and another villager; Mr. Dinali Sardar visited the Gobindapur BSF- Border Out Post on 04.03.2015 to enquire about the persistent harassment and subjugation of the innocent cultivators but the BSF personnel stated that the restriction is as par the order of the District Magistrate; 24 Parganas (North). Mr. Jamat Sardar contacted the Pradhan of Gobindapur Panchayet and found no such administrative order has come from the office of the District Magistrate. On 13.04.2015 the villagers submitted a written and signed petition to the District Magistrate of 24 Parganas (North) but till date no response and corrective measure has been taken. We found that the civil administration and BSF is systemically encroaching on personal liberty of citizens sometime by promulgating the section 144 of Criminal Procedure Code throughout the border for decades without any respite and various other restrictions, the civil administration never thought its legalities, only nodded in BSF’s illegitimate demand. . Theunjustified restrictions only prove that there is idiosyncratic approach of civil administration and partisan acceptance of Border Security Force’s request. The action is not only challenging the personal liberty of the persons but also proving scant respect for ‘right to life’, freedom to opt for occupation of choice and right to free movements of those persons as conferred by Article 21 and Article 19 respectively in Indian Constitution. Further, this act against the premises of Article 6 and 9 of International Covenant on Civil and Political Rights and Article 6(1) of International Covenant on Economic Social and Cultural Rights; government of India ratified both the UN instruments. In this context, I demand for immediate end of these uncalled-for and unjustified restriction posed by the BSF and civil administration and adequate financial compensation for the citizenry for their loss.